What’s On the Other Side of Quitting? There is nothing that is worth having that comes easy and if it comes too easy then you better beware of the strings that come attached with that feeling of ease. I remind myself of this every time I see someone who (no offense to the less talented) seemingly does not have the talent in one pinky that I have in my whole body achieve their goal (that they just thought up two seconds before actually going for it) practically overnight. It makes me wonder what the point is of me trying so damn hard and trying to fulfill my purpose because years of dedication still haven’t landed me in the position of the overnight success story. I think about quitting for about 5 seconds (okay sometimes a little longer than that) but then when I think about what is on the other side of me quitting I get right back at it and keep pushing through. 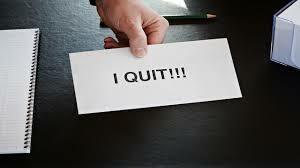 There is no achievement in quitting (unless you’re talking about quitting that job you hate to start the business you love). When you are sitting in the midst of that struggle, and you’re feeling that longing to reach your destination, and you feel like you just can’t wait anymore. Your patience is wearing thin. Just take a minute and think about the other side of the spectrum. You quitting on your dreams, you essentially quitting on you, leads to a lifetime full of wonder. It leads you to a lifetime full of what ifs and watching everyone reaching their dreams and thinking that should’ve been you. It will forever put you in a place of envisioning something that you just stopped reaching for. It will mean that all of the good in the world, all of the changes that you were supposed to bring about won’t happen now because you quit. Think about the lives that come after yours that will forever be altered because your dreams didn’t come to fruition and enable them to achieve their dreams. Think of the miracle that achieving your dreams would have brought into someone else’s life if only you had not given up. Think about the fact that victory was probably just around the corner but you just didn’t know it and you gave up right before you could see that light. It costs nothing to dream, to strive for that dream, and to put a plan of action into play in order to achieve that dream. But it could costs everything if you don’t. You don’t want your legacy to the generation that comes after you to be that you quit and that when things got too hard you found an excuse to give up. Stand up for your dreams, and push your way towards them. Don’t give up. It’s too important for you to reach those goals. Remember it’s not just your life that it affects. It’s the lives of your children, and the generations to come after you. It’s the lives of whoever is meant to be touched by your gift, by your dream, it’s their lives that quitting will affect. When you have a dream, particularly one that services many other people, it is not just about you anymore. So the next time you feel like throwing in the towel take a moment to think about what is really on the other side of quitting. Previous postWhat’s Wrong With Seeing the Glass as Half Full?